The following is a video of the presentation of the Six Nations Cannabis Survey results made by Aaron Sault of Green Health for 6. 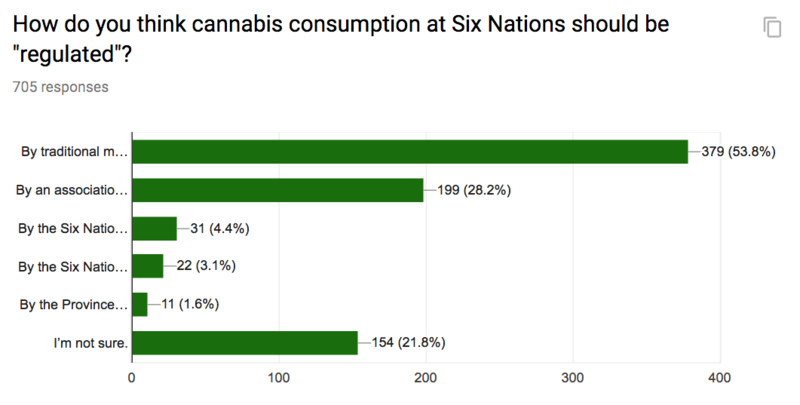 The initial results are now in for the Six Nations Medical Cannabis Survey. The survey was conducted between December 4th, 2017 and Dec 31st 2017. A full written report concerning survey results will be made available at the January 28th Community Meeting at Yogi’s Barn from 1pm-4pm, hosted by Green Health for Six. 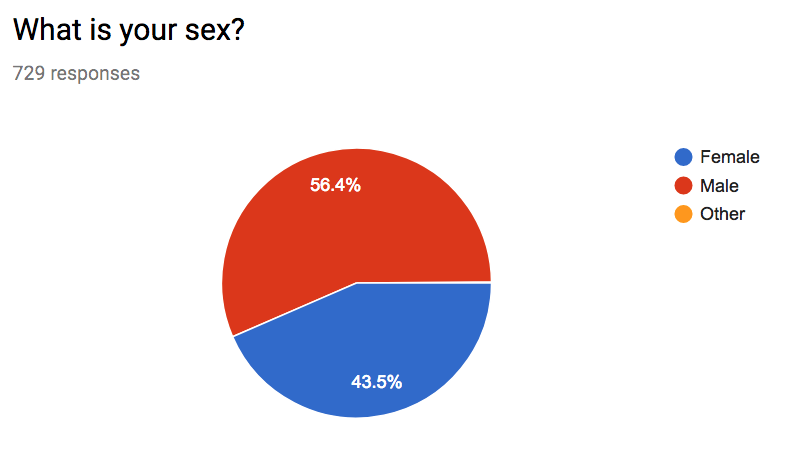 All graphs below were generated by Google Forms based on the data received from 731 respondents to the survey. Note that not all respondents answered all questions, and so the number of responses to each question varies. 56.4% of survey respondents identified themselves as male, 43.5 as female, and 0.1% as other. 88.4% of respondents indicated that they have previously consumed cannabis. 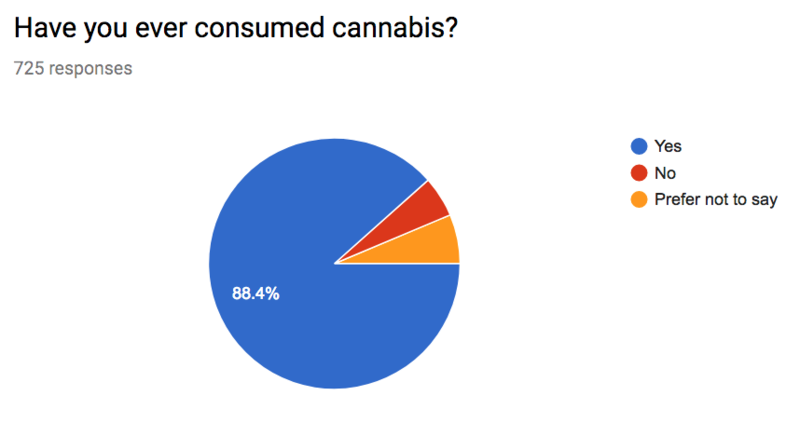 5.2% of respondents indicated that they have never consumed cannabis. 6.3% of respondents preferred not to say. Pain relief and stress (65.9%) were tied for first place as the two largest reasons as to why respondents use cannabis for medical reasons. Depression came next at 37.5%, migraines at 33.3%, Insomnia at 30.8, loss of appetite at 29.3%, fatigue at 24.1%, nausea at 20.1%. 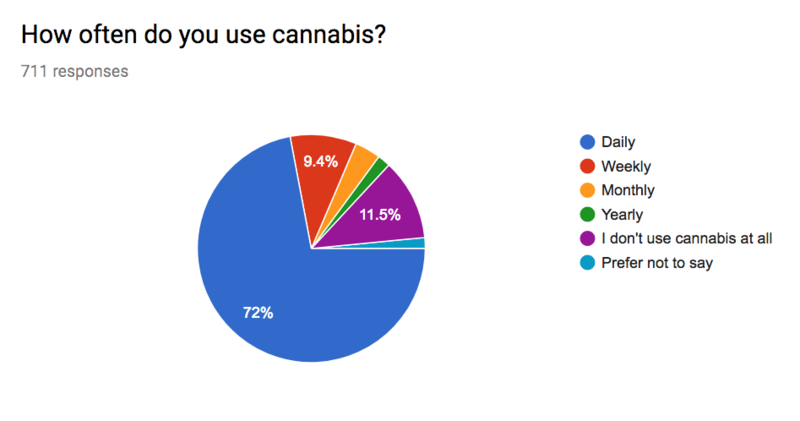 72% of respondents use cannabis daily. 9.4% use it weekly, 3.7% monthly, 1.8% yearly, and 1.5% prefer not to disclose their cannabis use. 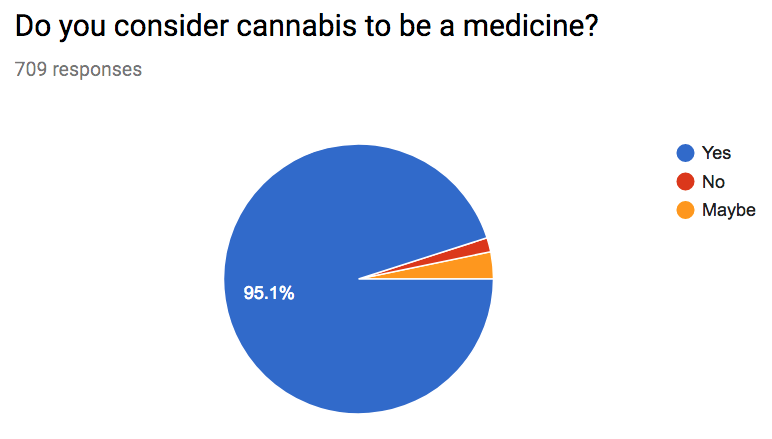 95.1% of respondents consider cannabis to be a medicine. Only 1.7% said that it wasn’t a medicine, and 3.2% said they weren’t sure. 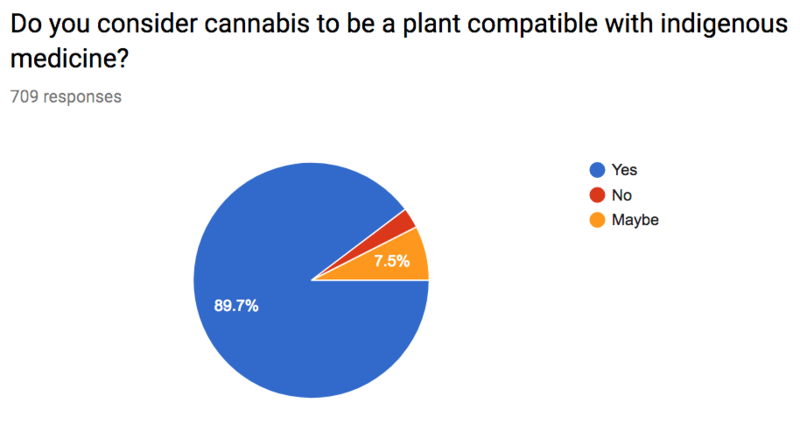 89.7% of the respondents said that cannabis is a plant compatible with indigenous medicine. 1.7% said it wasn’t compatible, and 7.5% said they weren’t sure. 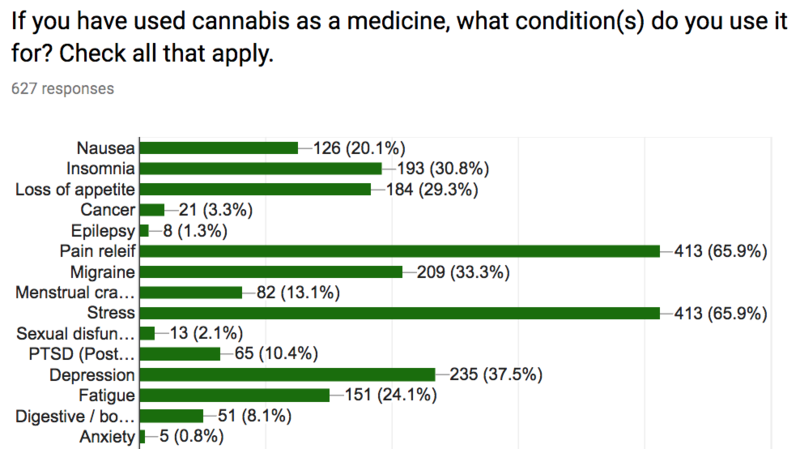 A majority of respondents – 53.6% – think that cannabis consumption should be “regulated” by traditional medicine people and according to Haudenosaunee custom. 28.2% said the industry should be regulated by an association of Indigenous cannabis retailers. Only 4.4% said they thought cannabis consumption should be regulated by the Six Nations Confederacy Council, and an even smaller number of 3.1% thought that the Six Nations elected council should have a say. The smallest number of respondents, 1.6% felt that cannabis at Six Nations should be regulated by the Province of Ontario and the Government of Canada. A comparatively large number of people 21.8% weren’t sure how it should be regulated. Many respondents indicated on their surveys that they wanted a combination of medicine people and retailers to regulate the industry. 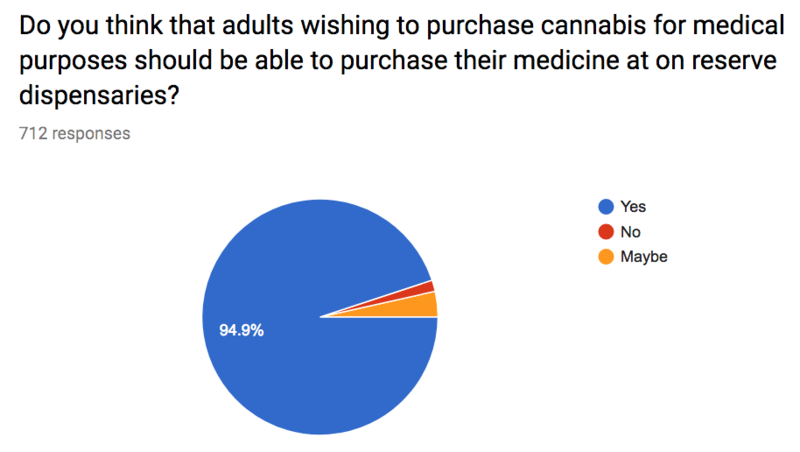 94.9% of respondents believe that adults wishing to purchase cannabis for medical purposes. 1.5% said it shouldn’t be made available, and 3.6% weren’t sure. 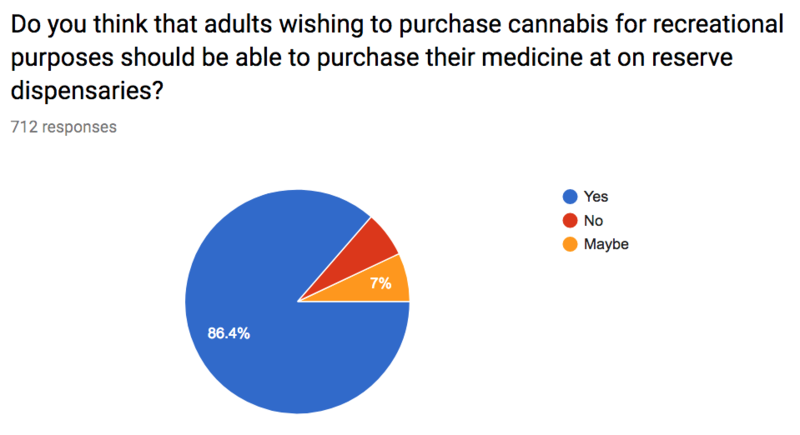 86.4% of respondents think that adults wishing to purchase cannabis for recreational purposes should be able to access it on reserve. 6.6% said it shouldn’t be made available, and 7% weren’t sure. 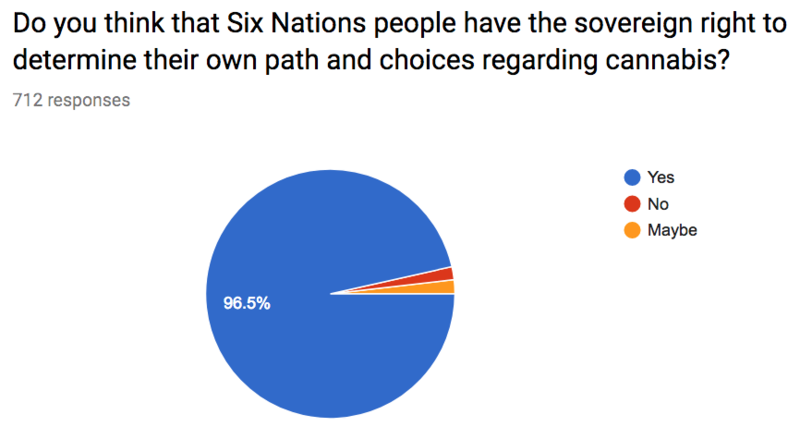 96.5% of respondents indicated that they believe that Six Nations people have the sovereign right determine their own path and choices regarding cannabis. 1.8% said Maybe, and 1.7% said no. 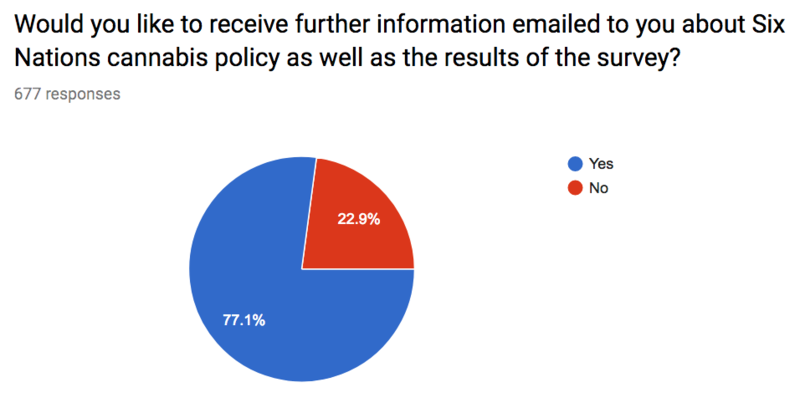 77.1% of survey respondents wanted more information, and 22.9% said no.